This peanut-tahini sauce is your perfect ally when trying to up your family’s veggie consumption. Most kids love the sweetish peanut taste, making it easier to gobble down a bowl of steamed or raw veggies. But I also definitely recommend bringing a jar of this dreamy, creamy peanut-tahini sauce to work to juice up your lunch salads, quinoa, or Buddha bowl (picture below). Lime is an excellent source of vitamin C and is quite high in vitamin B6, potassium, folic acid, flavonoids, and the phytochemical limonene. These nutrients give lime high antioxidant and anticancer properties and a strong antibiotic effect. Tahini is a paste made from ground sesame seeds also used to make hummus. Apart from being a very good source of protein and fiber, they contain lignans which are powerful antioxidants helping to reduce cholesterol. Sesame seeds are packed with healthy monounsaturated fats, and are extremely rich in calcium, magnesium, iron, and zinc. Peanut butter is made by grinding peanuts which are actually not nuts but legumes, cousins of peas, lentils and chickpeas. Anyway, peanuts are high in protein, good fats, antioxidants, B-vitamins, and magnesium. They’re heart protecting and can help improve cholesterol levels. 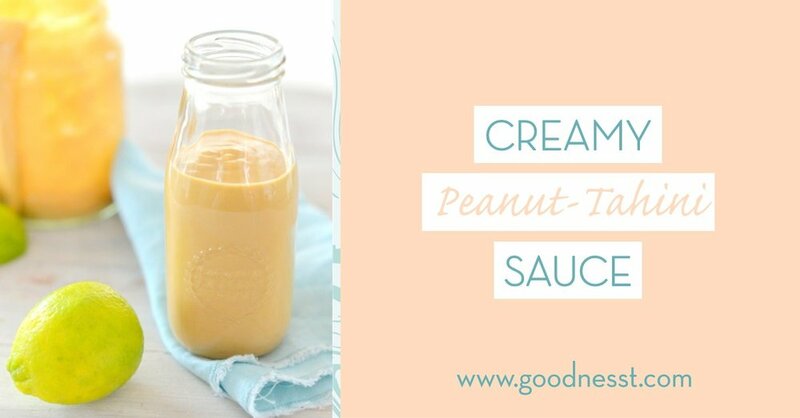 Just make sure to use pure peanut butter without any added sugars, palm oil, or preservatives. Maple syrup, just a touch is needed in this recipe to balance the flavors. Although it’s still “sugar” maple syrup is one of the better natural sugars out there. It’s a good source of zinc which helps with skin problems such as acne and boosts immunity, and manganese, important for energy production. Tamari, or fermented and gluten-free soy sauce, is an excellent alternative to soy sauce or salt for seasoning. It actually contains some protein and is a good source of vitamin B3 (good for heart and vessels) and minerals like iron, phosphorus and manganese. If sodium is of concern, make sure to buy the lighter reduced-sodium version. Over salad (when used as a dressing I like to add more water to make it a bit runnier). Over a bowl of steamed or grilled veggies (broccoli, pumpkin, carrots, sweet potatoes, leek, spinach, …). Eaten as a snack with avocado (I fill the hole in the middle with sauce and sprinkle some flax- or hemp seeds on top). Drizzled over a Buddha bowl (a colorful one-bowl dish with whole grains, plant proteins, and tons of vegetables). As a dip for raw veggies. Mixed with quinoa or brown/black rice. Drizzled on meatballs or falafel. Or as a sauce for fish or meat. Combine all ingredients in a glass jar and shake energetically. For an even smoother texture you can use your food processor or a small whisk, but I think the simple jar technique works very well. Refrigerate for up to a week but be aware it will thicken as it sits so add a bit of warm water each time you uses it again.